Bridal Shower Invitations. Made with high quality vector art for a professional sharp print. 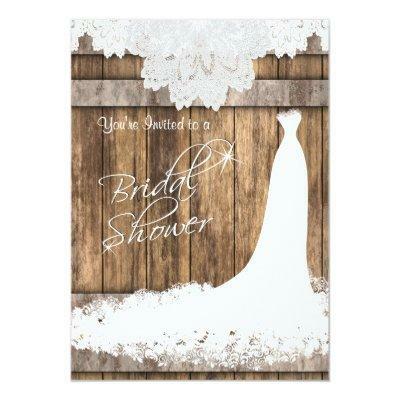 Featuring a beautiful rustic wood plank background with white lace top border and a beautiful elegant wedding gown. This bridal invitation will be a hit with your party guest. % Customizable. Ready to Fill in the box(es) or Click on the CUSTOMIZE IT button to change, move, delete or add any of the text or graphics. SEE MORE DESIGNS AT: (Bridal Shower ) original design by Donna Siegrist &#; . If you have any questions about this product please contact me at I will be happy to help. Thank you for the support and stopping by my store!